Beachfront - Last minute specials! Watch the dolphins swim by from your private balcony. Relax by the heated pool, or take a stroll on the beautiful beach. Great location close to golf courses, shopping, and many great restaurants. Half hour from Clearwater airport. 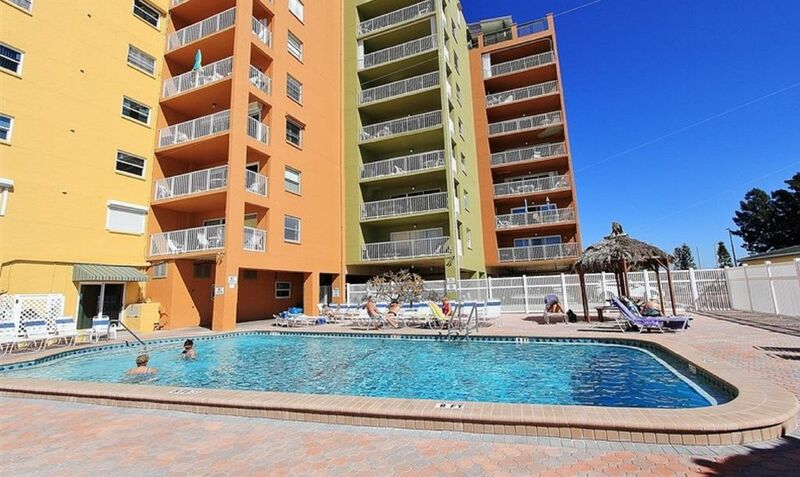 2br, 2 bath, direct frontage on the Gulf of Mexico. Fully equipped kitchen and all linens provided. Master br has a king bed, 2nd br has 2 doubles. Free Wifi included. Only 1 parking space is guaranteed. Additional parking on the street. New living room sofa, sofa sleeper with premium mattress and new paint in January 2018, bedrooms redecorated in 2016 with new king bed in master. New walk in shower in 2015. Sit on your balcony and enjoy the view of the gulf! Balcony is direct gulf front! Nice clean unit. Would definitely come back. Could maybe use a new mattress or two in the future. Great vacation. Thanks Bob. Great beach access. Good view from the room. Condo was clean. Everything was as advertised. Easy communicate. This was our 3rd year at the holiday villas and hope to be back soon. PS loved the warmth of the pool! Thank you! We really enjoyed our stay at this beachfront condo. You could see dolphins from the balcony and the beach was great. Condo was a little older, but clean and comfortable. Views cannot be beat for the sunsets. We came down to Indian Shores for a week of relaxation and we were not disappointed. I read the elevator was a little slow but what he heck, I'm on vacation to relax.. This fully furnished condo was perfect for our family of 6. There was plenty of space for everyone to stretch out and relax. The decor is so cute, the couches are comfy, the beds are super comfy, the balcony is large and we could see dolphins swimming by from it. The parking space is perfect, right across from the elevator and was big enough for my large vehicle (Yukon XL). The pool area is big with plenty of chairs and you have the perfect view of it from the balcony. The beach is just a few steps away and we enjoyed taking our daily walks finding shells. I can’t express enough how much we loved this condo and how great it was renting from Ron. He is such a nice guy and a joy to work with! We can’t wait to go back!